There are two paths between Addis Ababa’s top hotels. If you ask the guards at the Hilton how to get to the nearby Sheraton, they will politely point right, up the smooth concrete road. If you ask one of the kids who variously shine shoes, sell gum, shout ‘Farenji!’ and offer to be your guide however, they will beckon you across the street, off the tarmac, and onto a scrub road leading along the Sheraton’s high walls. While the guard’s looping route takes you past manicured gardens, and the newly painted periphery of the Prime Minister’s residence, the kid’s route is quicker and dirtier. Tin-roofed, but long established huts are stacked tight, breaking only for steep, winding pathways and haphazard open drains. Thousands live in these simple homes and go about their business while tourists, businesspeople and aid workers swell the swimming pools beyond the fences and guards. This stark divide was shocking to me five years ago as I walked the route as a first time visitor to the country, but the locals didn’t see what I did. Over time, I became aware of a diverse middle class of shop owners, taxi drivers, and civil servants who lived in the centre of Addis Ababa on mediocre earnings and gave the city a feel of openness and egalitarianism. They saw wealth but didn’t feel threatened by it and were able to live happy and full lives amidst the bustle of Addis Abba. All across the country however, a new economic urgency seems to be taking hold. As quick as the capital’s concrete shopping centres continue to rise, so Ethiopians are asked to modernise, develop and participate in building the country anew. The government has led the way. Alongside Korean laid roads, Chinese foremen oversee the installation of fibre-optic cable, promising broadband internet access to newly connected populations. In the fields beyond, recently constructed tunnel tents house flower growing businesses born out of fresh international partnerships. More ambitiously, the government is building the largest hydro-electric dam in Africa and aims to be a net exporter of energy when it is complete. Even within the country’s notoriously bureaucratic ministries, the spirit of modernism is taking hold. The Ethiopian civil service has completed the largest implementation of Business Process Reengineering ever attempted, and now schools, council offices and hospitals all talk of processes rather than departments and customers rather than citizens. There are many positives to this new spirit of progress and Ethiopia remains a country sorely in need of development. But despite the positive rhetoric of the Ministry of Information, something is not quite right. This modernist wave – unmatched since the heady days of Africa’s post-colonial period – seems not to have swept everyone along with it. I’m drawn to ask, where are the poor, the rural, the uneducated, the old – the people who don’t yet seem prepared for the next great leap forward? From the pastoralists displaced by the new dam, to the patients who can’t afford the new services on offer at corporatized hospitals, many Ethiopians are being left behind. 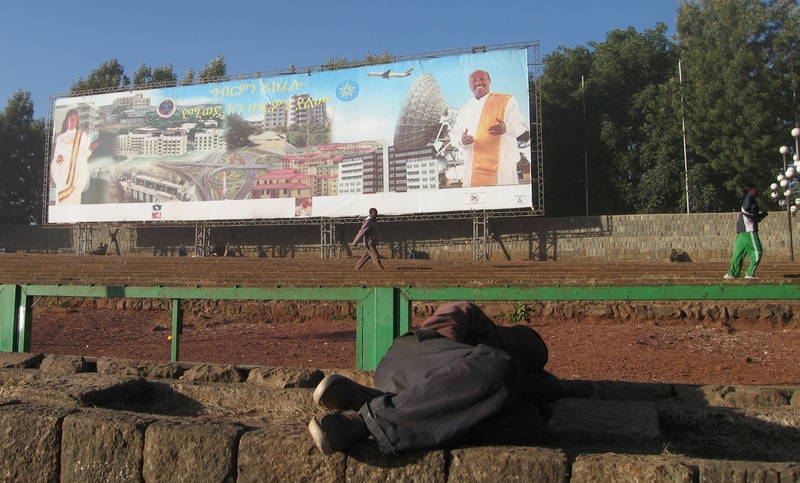 There will be many losers in the great transformation gripping Ethiopia. In making such claims, I’m aware that I expose myself to a narrative that configures criticism like this as the death rattle of much derided, western paternalism. This narrative suggests that business leadership and strong African governments have obviated the need for development agencies and their unproductive endeavours. I’m not writing in support of that failed and failing paradigm however. What I’m saying is that the type of ‘business thinking’ and modernist approach visible in all of the activities mentioned above shouldn’t understand the citizen-customers of these new projects aspirationally. Will the broadband unleash a new generation of entrepreneurs? Will the electricity allow industry leaders to surge? Will corporatisation help hospitals improve the health of the nation? All of these interventions need to be matched to the needs of the population rather than the hopeful vision of the government. The energy generated by this modernist enthusiasm needs to directed towards the very real requirements of devastatingly poor communities struggling with very real problems. Just before I completed some recent fieldwork in Ethiopia a strange thing happened. All around Addis, bright green and yellow fencing was erected around the city’s poorest neighbourhoods. An important meeting was to take place at the African Union and heads of state from around the continent would be taking in the streets of the capital. Clearly, the government is becoming embarrassed by urban poverty. But the government can’t hide its poor people in the same way that the Hilton’s guard could. If the government wants the country to develop rapidly, to modernise and thrive, it must start trying to help its poorest citizens rather than hiding them away. Great post! It strikes me that these same problems affect places perceived to be ‘developed’ as well – governments use eminent domain to push out unsightly poverty. London will suddenly look spruced up and run smoothly for the summer Olympics. International heads of state don’t see the Appalachian communities blighted by meth addiction and grinding poverty when they visit the US either; somehow this isn’t taken to be ‘representative’ of America the way that the poor are thought to be ‘representative’ of African countries. Of course governments should help their poorest citizens, but their failure to do this in the name of ‘progress’ is a global problem with the paradigm of ‘modernity’, not an African specific (or even ‘developing’ country) problem. Certainly, I’d never try to suggest that modernism is an Africa-specific paradigm – the reforms I study have their origins in the UK. What is notable is that the effects of these reforms in the west are, despite their bold rhetoric, ‘perplexingly equivocal’ (as one academic put it). In Ethiopia however, where there are so many people who live as they say ‘hand to mouth’, the sudden price increases and system changes wreak havoc. Due to the specificities of the Ethiopian context, there are also fewer controls over the implementation of new projects and the government is famously headstrong. In sum, the government is less constrained and the poor are a lot more vulnerable. This isn’t African exceptionalism, its recognition of a particularly damaging form of something we know well. Nice article. How does a changing global economic order affect what you describe – does an increased number of potential patrons empower African governments like that in Ethiopia? Have new patrons engaged in different ways, and if so, what impact has that had on inequality? We are seeing a fascinating period of change around the world. Your depiction of some of the symptoms of that change is quite concerning. Thank you for bringing it to our attention.